Today’s eyesore is a little different that its predecessors. Vinyl siding is involved— in more ways than one. 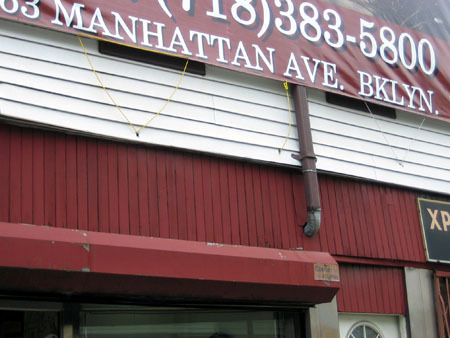 The above sign can be found at 609 Manhattan Avenue. 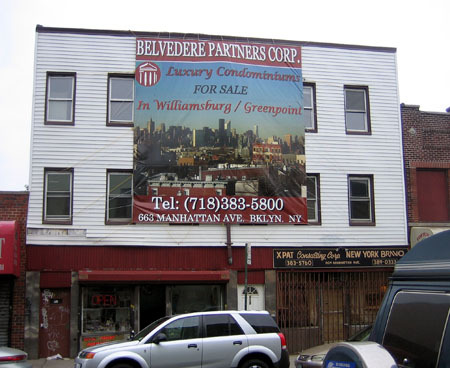 Not surprisingly, the office for Belvedere Partners is located almost directly across the street from this grossly inappropriate (and legally questionable) piece of advertising. One has to wonder what the neighbors must think about being forced to look at this turd everyday. Call me presumptuous, but I doubt they like it very much. I also suspect the FDNY might have a few things to say about it too, but this is just an educated guess. Could you imagine what would happen if someone had the chutzpah to do this on Bedford Avenue? Or better yet— Seventh Avenue in Park Slope. There would be rioting on the streets. Yet, doing this in Greenpoint is perfectly acceptable. Interesting. Then again, maybe this building got tired of the endemic neighborhood stink and the sign serves as some sort of mask. In closing, I would be remiss if I didn’t point out my favorite feature of 609 Manhattan Avenue. Your eyes are not deceiving you. The person(s) who installed this tarp DRILLED HOLES in the vinyl siding in order to anchor this sign. Very nice. Being a horror movie buff myself, I feel compelled to point out that this house reminds me one of the cenobites in the movie Hellraiser. P.S. : I have started a new group on flickr called “The Greenpoint Condominium Cavalcade“. Check it out.